The Days of Johann, an agility dog! : We made it! We made it, we're at our new home! On Tuesday we woke up early and gathered a few more of our toys and our bowls. The movers arrived in the morning, and packed up our stuff. 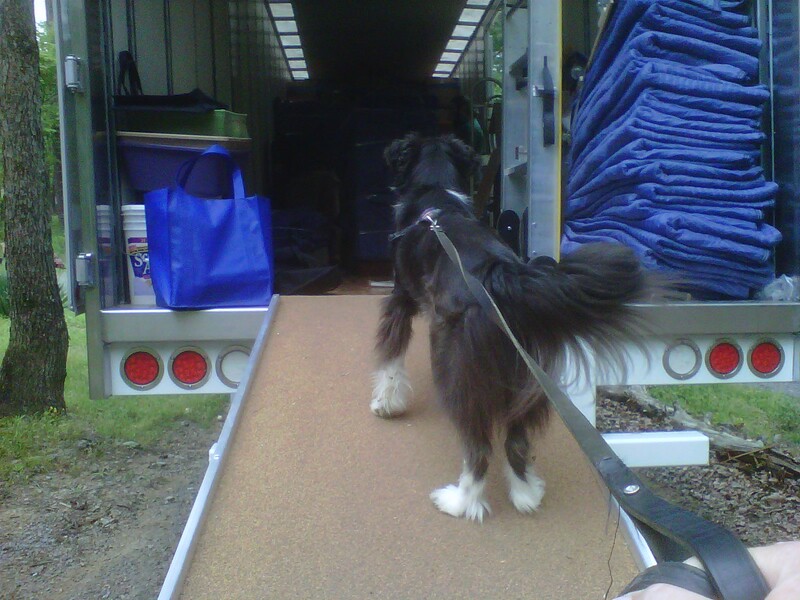 (Gracie and I supervised :) Then we helped Mum clean up a bit, packed up Wolfie and Wiggy, and headed to our new cabin in the mountains. We got there, and helped supervised the movers to get all our toys, beds and bowls in the right room. We didn't get much sleep that night with all the new noises, so woke up early to get our computer ready for the cable guy yesterday morning. He showed up right on time, and we had our computer up and running by about 11 AM. We new we couldn't get any cell phone coverage here at the cabin, so the great folks at Sprint sent us one of their new Airaves for free. It's a little mini cell phone tower. Mum got it hooked up around noon and voila! We have five bars, just like they said it would do! Have to say that this little gadget is super cool. Then about Noon, the guys showed up to hook up our TV. Just in time for us to get notified that some Super Cell storms were headed our way. Have to say that those weather folks on TV were super busy yesterday! There were so many tornado warnings in counties all over the SE, they sure had much more than an online it degree, that's for sure! What a wild night it was! We were very lucky, two tornadoes hit just south of us, and Super Cells were all around. We watched the radar, stayed in touch with friends and news outlets on Facebook. At one time we got in the downstairs bath with Wolfie, Wiggy to ride out the worst part. Mum was super proud of us...we were attentive, eager to do whatever Mum wanted (even the kitties!). We were calm in the bathroom all the time, and we didn't get out until the Netbook radar said it was safe. What a wild second night in our new home. Our hearts go out to everyone affected by the storm and to all the new friends we've made while living down here in the southeast, hoping they are all safe. The news says this is one of the worst outbreak of tornados in history in this area, with over 160 tornadoes spawned by this storm. We are feeling very fortunate right now....thank DOG! So today we are unpacking, and helping Mum catch up with work. The weather is supposed to be nice this afternoon, so we may get in a nice, well deserved, little hike at the nearest trail head. So much happening! Very exciting to be moving but sorry all the horrible scary came with it too. Glad you is safe. Glad you are safe and sound! Such scary first nights you all had there. Do you like the cabin as much as you thought you would? I sure hope so! thank goodness you are all safe and sound...can't wait to see photos of your new cabin! We are happy to see woo made it AND woo are safe! I wish you all lots of happiness in the new home. And I'm sorry to hear you were affected by the terrifying storms. It's great that the dogs were able to be calm.